This post would be more aptly named “How to entertain family and friends while attempting to build a bed without the proper tools and time” or maybe “20 household items that can be used in lieu of construction clamps” or even “How to trick your man into DIY-ing on movie night”. We have had the same bed frame for the past 10 years and I have been wanting to switch it up, but you already knew that because I have painted it twice now trying to get a new look. Paint just wasn’t quite cutting it so when I saw a bed in Pottery Barn that was part upholstered/part wooden bed frame – it got my wheels turning. In theory this is really a simple project, you know, if you decided to gather the proper tools to do it, or did any research rather than just winging it – but hey that’s what you have me for right? Research done! I can now tell you the best way NOT to do this…but also what worked too. 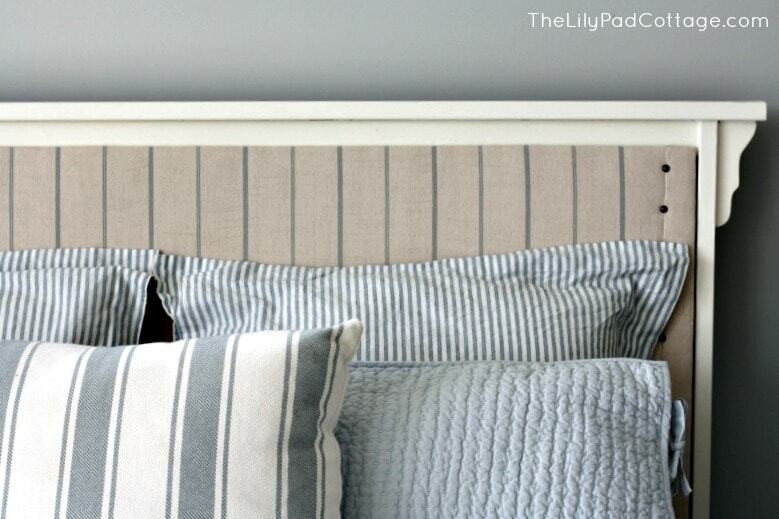 The first step is easy enough; measure the back portion of your headboard (and your foot board too if you have one, you will need to put one panel on each side) to figure out what size you need the panels. Then head to Lowe’s and get the thinnest/lightest plywood they have cut to fit. The thin light thing will be very important later…trust me! Next grab your fabric, batting, and staple gun. Attempt to upholster your boards. Realize upholstering such large boards is more a 2 person project and call your amazing mother in law upholstering extraordinaire (I apologize if you don’t have one of these handy, but I’m not sharing mine!). One stapled finger and thankfully no tetanus shot later (hopefully you can avoid this part) you will have your boards done. I also added this pretty nail head trim to disguise the fact that I had to add to extra pieces of fabric to the end of my board. The fabric was just 1 inch too short (this should have indicated to me right off the bat that this project was not going to go smoothly). I started with the foot board and naively thought if I watched some Dora with my 5 year old we could just lean up against it together (yes I’m not above child labor over here) and in no time it would be stuck…which would have worked if my little girlie didn’t bail on me after 5 minutes to go color. Now imagine with me if you will, me gathering up anything and everything heavy in my house and trying to prop the panels up. While you are at it, imagine me in my best contortionist act with both hands and feet on the panel trying to hold it up. This was a fail too, apparently I need to hit up yoga class more often. I think he might have temporarily lost faith in me and my DIY abilities (and possibly my parenting skills!). We got the kids in bed, clamped up the foot board and hooray it was working! Story over, we all sleep happily ever after right? 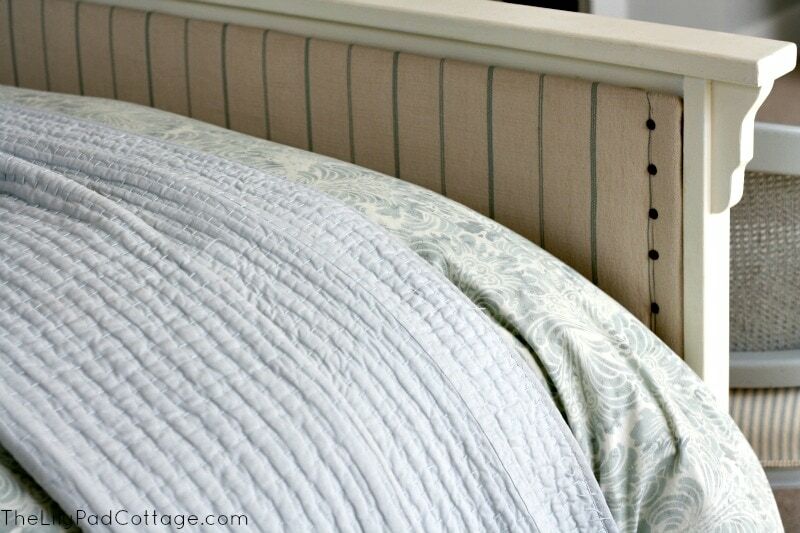 Well no, then we got to the headboard – the clamps would not fit over the thicker trim of the headboard. So picture this contraption I rigged up – just our box spring on the bed covered in 1 x 4 boards, then my grandmothers chairs on top of the boards, with me and the Mr. sitting in the chairs in our pj’s (the Mr. respectfully requests you not picture the him in his pj’s part) leaning up against the panel for 2 hours waiting for the glue to dry. I say romantic movie night right? Not so much, but we got it done! It is still standing several weeks later, we have not been concussed in the middle of the night by an upholstered panel falling on our head and most importantly it looks pretty! I love this! 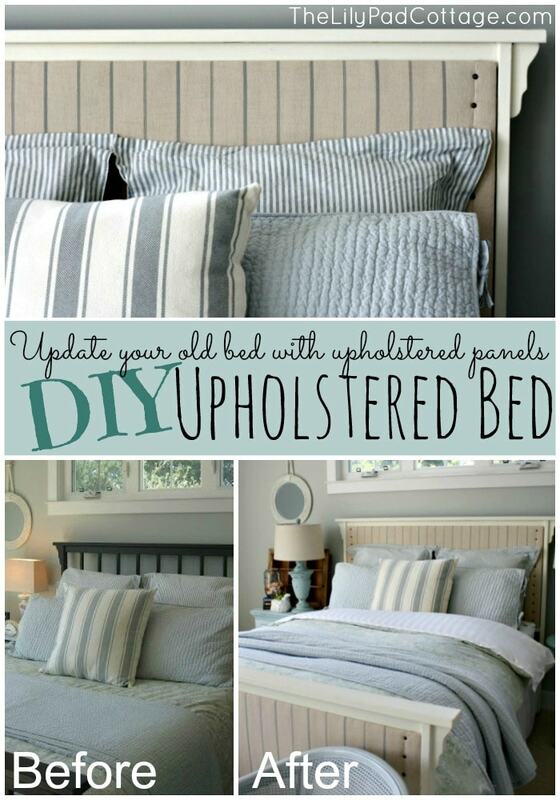 I’ve never been a huge fan of upholstered beds. They are fine – some I’ve liked but this one makes me want one of my own! Great job! Thanks Jill, it is so much more comfy now. You are once again an amazing DYI Woman!!! The bed looks fantastic. 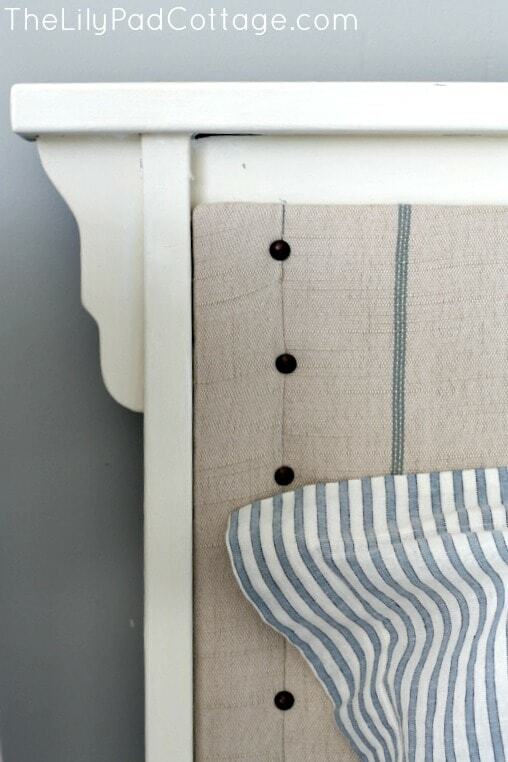 I have been wanting to do the same thing to our headboard and have been going over in my mind on how to do it. Thanks for the inspiration and the tips! Beautiful! But I need to know the color of your walls and the cane chairs STAT!!! The walls are benjamin moore arctic grey, and I have no idea what the chairs are – I spray painted them long before my blogging days! Just another day in the life, right?! For all the mishaps, it turned out great! This story had me laughing so much and picturing all these things in my head. By the time you went to bed, you must have been exhausted!! I can hear my husband in my head as I was reading this. By the way, this sounds exactly like something I would do, the only difference would be when my husband came home I would have looked at him and said, fix this PLEASE!! My husband, being the great man he is, would make it work for me some how. At least you stuck with this project until the end. I however, would have made the poor man make it right for me. I am sad, what can I say. Anyway, I LOVE the way this came out and the story was a treat in a way. It proves these things happen to everyone not just me. Oh I wish my hubby could just sweep in and fix it, but when I ask him to hand me a wrench he is just as likely to hand me a pliers :) He has many good qualities but being handy is not one of them lol! Kelly, what a transformation. Love the fabric you chose. Can’t wait to see more. Yes, definitely paint first! Good luck!! Gorgeous, Kelly! I love the stripes. 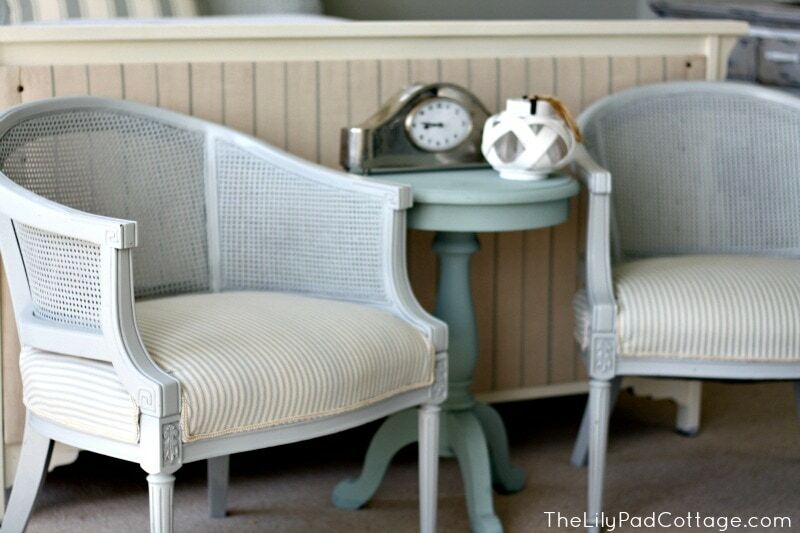 I know you’re not sharing it yet, but are those chairs painted Paris Gray surrounding a Duck Egg ASCP table? I’m thinking about using those 2 colors to paint a hutch and I’ve been looking all over to find a picture of them together! LOL!!! Kelly you are hilarious!! I can totally picture you and your girl leaning up against that while watching Dora! I’m so glad to know that I’m not alone in the “DIY winging it” department. :-) But it seriously turned out so beautifully and I think you must appreciate it even more knowing all that went into creating something so gorgeous. Well done girl! Amazing! What a genius idea! This is beautiful. 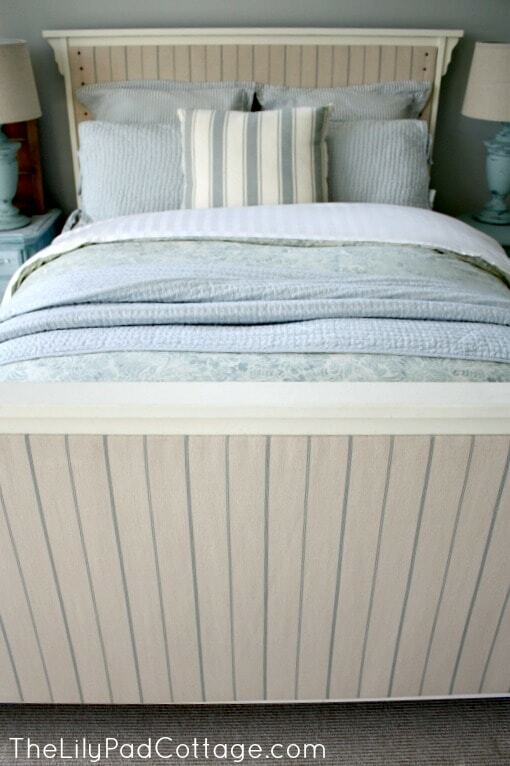 I love your fabric choice soothing and classy, absolutely perfect for a bedroom. I am excited to see the chairs finished. I would love if you could share this on our Tip Tuesday Party. Love how it turned out Kelly! So, so pretty! Sorry I put the email without my gravatar previously. Love your new/old bed. The fabric is wonderful and the cottage look is just perfect. Thank you so much for sharing the makeover and the experience. I laughed all the way though in sympathy and empathy – I could imagine myself doing the same thing….. This looks beautiful. I would have opted for a Velcro attachment so I could change out the panels when I tire of it. Because after all, any DIYer know that you’ll want to change it at some point. Great job! Greta job on the upholstered headboard! Best.story.ever! hahaha love it and the bed! You did a great job..even if it meant going through all of that! Oh my….how funny!!! I can see that glue drying contraption!!! Anywho….looks fantastic…great job! Love your site and came on over from “Knock off” to check it out. Have a great week. You have such a good eye and always your space is serene and gorgeous! Thanks for sharing at the Life Inspired Link Party. Love it! Where did you find the fabric? I love the fabric you used, too! 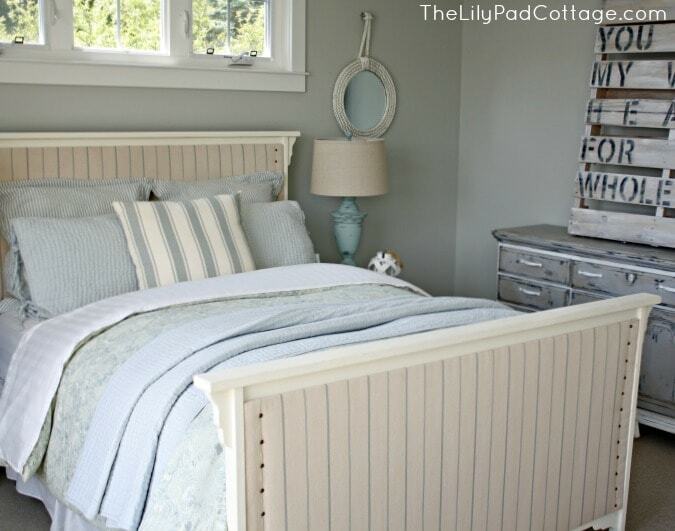 I have that exact bedding, and have been wanting to do an upholstered headboard, but haven’t been able to get the colors right. What is the fabric? Wow! Beautiful transformation, Kelly! Love every detail! 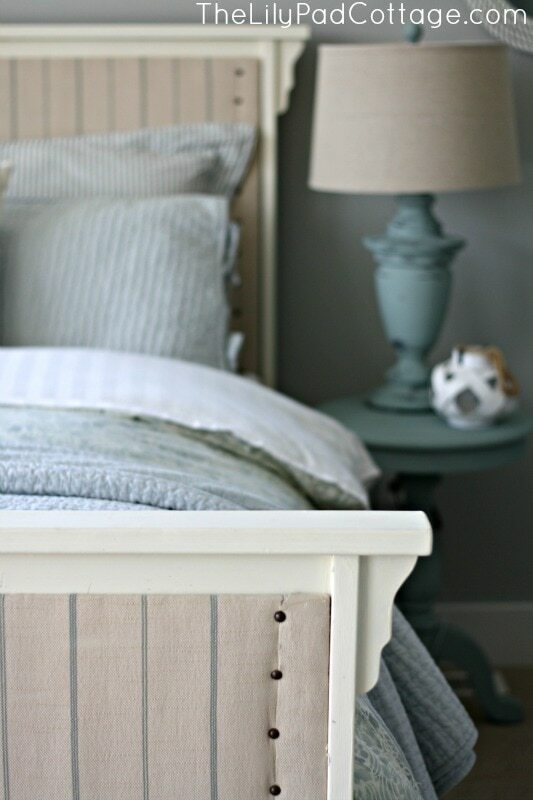 I’m pinning and including a link back in this week’s DIY highlights on Friday. Oh it turned out so perfect. I love it and your bedding too. Everything is just gorgeous. I found you via Roeshel over on her DIY Show Off. I wish I could have the exact same in my tiny bedroom. I recently built a wood headboard myself and it does not take much to make them VERY heavy. Funny how projects will seem so easy in your own mind, then you find you can not do it ‘that’ way. I ended up cutting my head board down 3 times….. it was just too large for my tiny room. I am procrastinating now on doing some final touch ups….. like dry brushing some white over the blue and adding another board behind the legs of mine for more support and also another short (baseboard high) one in back of that, to keep it away from the outlets and so my curtain panels can fall between it and the wall. Thank you for sharing your uh oh’s and the final result. I can’t have fabric covered…. too many fur kids that can get very dirty, very quickly. Love this!! And LOVE your bedding!! Did you make it of do you mind me asking where you got it? Hi Jenny! Oh I wish I could sew ha, my bedding is from Pottery Barn from a few different collections. Not sure they have them all still but you could check? Good luck! I have that exact bedframe and I hate it! Finally convinced the husband to let me do something with it, though what i had in mind was WAY more complicated and this result is much prettier the the plan in my head! So doing this asap! Well done! I like everything except the liquid nails part. My hubs been wanting a padded headboard for years because he likes to read in bed. I’ve been thinking of doing something similar but I don’t want to harm the bed’s finish.